James E. (Jim) Gross Park. (formerly Lincoln Park) (A) ? James E. (Jim) Gross Park. (formerly Lincoln Park) (B) ? NOTE: When requesting use of the Reid Menzer Skateboard Park, applicant must provide proof of liability insurance in the amount of $1,000,000 naming the City of York as an additional insured for the day of the event. NOTE: Absolutely no water activities may be conducted in Kiwanis Lake (NO WATER ENTRY PERMITTED). Individuals may not enter the lake at any time for an event. Have you discussed this route with the Sergeant? Will you be erecting tents or canopies? Any single tent or canopy over 240 square feet requires a building permit from the City of York. Will you one or more stages at your event? Will you have amplified sound at your event? Sound levels must comply with City Ordinance Article 714 Noise, and not annoy or disturb residents. Will you have inflatables at your event? 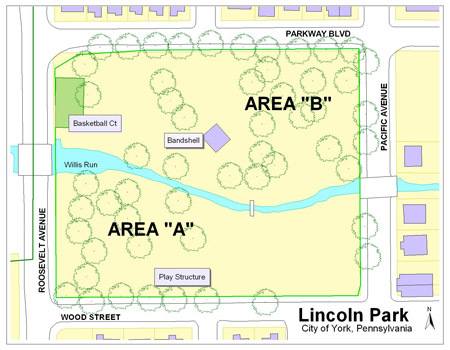 Placement is subject to City of York Park approval and proof of liability insurance in the amount of $1,000,000 naming the City of York as an additional insured for the date of the event. Will you have alcohol at your event? ALCOHOL IS STRICTLY PROHIBITED ON CITY OF YORK PARK PROPERTY. Commercial establishments that wish to serve Alcoholic Beverages outside in the downtown must obtain the necessary LCE approvals and must comply with York City Ordinances. Please forward a copy of the LCE approval along with your Activity Permit request. Written approval is required from the Mayor's office before proceeding with your event. Please check here to acknowledge you have read and understand the requirements. Are you planning to give food away, sell food, or have food vendors? You have indicated that food will be a part of your event. A permit is required from the City of York Health Bureau. Permits, Planning, & Zoning Dept. Do you plan on supplying security for this event? Extra fees for security may be required and will be determined by York City Police. Will you have fireworks at your event? Additional Fire Deparment fees may apply. A special permit is required from the fire department, plus proof of liability insurance. Restrooms are not available after September 30th. Would you like extra trash can receptacles? Parking Meters - To reserve a meter, it is $13.60 per meter per day. Non-Metered areas will require No Parking Signs at $1.00 each. The signs for No Parking must be purchased "in person" at City Hall, 101 South George Street, Finance Dept., 1st Floor. Fee is payable separate from the permit fee and is not included in permit fee total. Signs must be posted 24 hours before the event for enforcement. There will be an additional flat rate charged for all Street Closing/Barricade requests. Cancellations must be made in writing 14 days prior to the event date. The approved copy of permit (if it has been issued) must be returned to Parks & Recreations Office before a refund will be processed. A $6 administrative fee will be deducted from your refund. Parking vehicles on a city park is strictly prohibited. Vehicles parked illegally on a city park are subject to enforcement by the York City Police. Fastening or attaching and rope, sign, banner, flier or other object to any tree or shrub in the Park is prohibited. Applicant agrees to faithfully observe and comply with the conditions, regulations and provisions prescribed herein and by the ordinances of the City of York, the laws of the Commonwealth of Pennsylvania and the United States of America. Applicant shall ensure that all guests, vendors, concessionaires and exhibitors comply with the conditions, regulations and provisions prescibed herein and by the ordinances of the City of York, the laws of the Commonwealth of Pennsylvania and the United States of America. Special Event Permits shall not be assigned or transferred. No rain dates. Applicant agrees to indemnify and hold the City of York harmless from any liability to any person resulting from any property damage or personal injury occuring in connection with the event caused by the applicant or the sponsoring organization, its officers, employees or any person under its control. I do solemnly swear (or affirm) that all answers given and statements made on this application are full and true to the best of my knowledge and beliefs. I have read the terms and conditions outlined above and agree to abide by them. Due to the nature of your request, our online form will be insufficient for your needs. Please fill out your information below and we will be in contact to discuss your event.